Title. Has to be original villains. My concept is the rest of Kaos' family. We have his father and his two brothers. Kaos' Dad - The father of Kaos. He is basically a mix of Super Kaos and Ganondorf. He is very muscular, wears lots of armor and has a long cape. He is extremely powerful able to levitate and cast really spells. He can summon almost anything out of thin air, such as weapons or objects, as he is so strong with Mind Magic. Besides spells, he uses weapons such as swords, axes and hammers. He is very mean to Kaos and bullies him often. He is not on good terms with his ex-wife - Kaos' Mom. Klutter - Kaos' first brother. He's very muscular and broad shouldered. He's physically strong, but clumsy and not very clever. However, Kao's Dad likes him because he always does what he's told. He picks on Kaos, too, picking him up and giving him noogies, or coming up behind him and scaring him. He wears fancy clothing but it often has food stains all over it. He has a black afro. Krogan - Kao's second brother. He looks just like Evolved Kaos from Trap Team, expect he has a pony tail and wears an eye patch. He's quiet and is the only one who's not mean for Kaos. However, he's secretly pulling the strings. He manipulates his family subtly without them knowing, convincing them of what schemes to carry out while they think it was there own ideas. In the end of whatever game he appears in, he backstabs the family, trapping them all and taking control of his own plan to rule Skylands. He'd be very similar to Evil Morty from Rick and Morty. A FE style mage with a big, blocky computer monitor for a head. The screen displays an evil face. He uses his technology powers to "hack" the academy, and temporarily take it over. A female elf who does literally nothing but complain about the skylanders and how they're "problematic." Eruptor promptly pushes her into lava by "accident". A father to kaos in the loosest sense of the word. He believes his son is nothing more than a mistake and an embarrassment to his heritage, yet still has the audacity to lead him on. He constantly gives Kaos' royal brothers more respect and praise, and leaves Kaos to fail without any kind of worry or concern. Even when Kaos manages to do an evil act that would be considered impressive for him, His dad will pick out even the tiniest flaw and tear him apart for it. His power comes from the pain of others- the more pain and suffering he causes, the more powerful his magic can get. With a heavy bias towards Kaos' siblings and no respect for Kaos whatsoever- Kaos' dad can only be described as "The Dean Of Mean." Wow Zap that is a surprisingly great idea of what Kaos's father could be like and would be a nice way to explain all of Kaos's insecurities and his desperate attempts to be the greatest evil in Skylands. Activision really need to hire you to write the lore of Kaos's father because you clearly know what kind of character he should be. Repentus: A former Portal Master who loved the Skylanders so much that he simply went insane and found a way to get to Skylands from Earth. He however turned into a puppet as he was manifested into a form based on desires, thoughts and his motives for Skylands. He went to terrorize Skylands so he could rule the world and use the magic of Skylands so he can conquer both Skylands and Earth. he uses a terrifying scythe as his weapon, a giant puppet controller he can use to fly like a propeller, can shoot puppet string to manipulate others and can even turn others into puppets, summon puppet Portal Masters similar to and has an evil organ grinder based on a pretty terrifying childhood scene froma movie I saw as a kid that can cause people to dance uncontrollably that would lead into turning others into puppets. The whole idea of Kaos' father still irks me. Way too easy to just be a clone in character like Kaos' Mom or just feel shoved in - not to mention we haven't had any lore confirming or denying that his parents were ever together because of the conflicting Story Scroll from SSA. This guy is from that fanfic attempt way back. Oldie but a goldie. 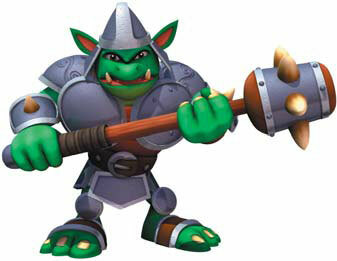 Gaul(Skylanders) - formerly known as Skellywag, Gaul is a shell of what once day used to be a Skylander. One of the few remaining from Nattybumpo's team and as resilient as the name implies, the Undead ape was one of the most specialized in dangerous artifacts due to his days as a mercenary, but they would turn out to be his doom. When he seized the Emerald of Torment from newly-recruited skylanders from Master Eon during a dangerous mission, it took over his mind and body, becoming a malevolent growth over his eye, and the group could barely escape with their lives as he became a rampaging beast, nigh unstoppable due to the protective spells over Skylanders and his Obisidian Skeleton armor. Iirc the guy was Earth at the time I wrote it(and never finished), but it barely fit the backstory. balthazar: balthazar is an undead spellpunk that once served in kaos's army until he tried to dethrone kaos, but it ended baddly and kaos banished him to the outlands, where balthazar gatherd a small army and came back to skylands to try to conquer it. balthazar is basiciy a swapforce spellpunk only with a large black cape and a golden crown on the tip of his hood. he can use a normal undead magic, lunch black lightninig bolts, summon Rhu-Babies and skeletal trolls and can use teleportation. balthazar is a kinda like kaos, he is overconfident, egoist, obnoxious, delusional and a little naive. the final shadow: first of all a little lore: long ago when the darkness terrorized skylands for the first time, the ancients along side the first portal masters and skylanders maneged to defete the darkness and banish it, but it didnt over there. when the darkness was banished, some parts of it disconnect from it and got a mind of thier own. that was when the "shadows" were born, the shadows are the remains of the darkness, and much like the darkness they are cruel, devious, powerful and deadly. for long time teh shadows spraded chaos and mayhem everywhere they went, trunning skylands upside down. luckly the ancints, portal masters and skylanders have managed to hunt and destroy each and everyone of the shadows. but only one managed to survive till this very day, the most powerful, brutal and deadly shadow of them all, the ancints named him "the final shadow". he manged to hide himself from the eys of the ancints and he only wait for the moment to strike and destroy skylands. the final shadow will look like a mass of black smoke with empty eyes and a creepy smile, he can posses anyone and anything, he can take control of machines, animals, skylanders and even the ancints themselves. he is very intelligent and sophisticated, he can manipulate anyone to do his orders even if they are aware of it or not, he can strike fear even agienst the bravest warriors and he can hold gradge for a long time. Klown: A scary clown who was Kaos' childhood hero. Kup Noodles: A bunch of noodles that uses his delicious but unhealthy composition to damage the Skylanders. Killer Krok: Kaos' crocodile... That's it really. Jim Kummings: The real-life actor gets brainwashed by Kaos and now he's trying to kill all Skylanders, because he thinks he's in a movie about hunting them. SPLERROR: Mags once made a machine that could duplicate Skylanders to increase their chances against Kaos. Splat was the first and only test subject. The machine failed, causing an explosion which took a few days for Splat to be able to heal. However, this experiment was partially successful, creating a corrupted version of Splat. Dubbed SPLERROR by the others, they want nothing more than for everything outdated to power down for good. Their elements are mostly Magic and Tech, however they have shown signs of others, such as occasionaly leaving slight burn marks beneath their hooves. They mostly wander around Skylands, looking for things to destroy. Splat is usually uneasy talking about this. I'm sorta bad at naming things. Evil Glumshanks - Glumshanks from the Mirror of Mystery dimension. In the Mirror of Mystery, he's an evil genius, as well as very aggressive and abusive to Good Kaos, his sidekick. He escaped the Mirror of Mystery realm and lurks in the Outlands. He's very talented with machines and technology, but also possesses dark-magic powers, like summoning bolts of black lightning, creating portals, and other things. His main weapon is a large gun with a glowing green barrel. When he shoots someone with it, lots of effects can occur. These includes putting people under an anti-gravity effect, shrinking them to the size of an mouse, just causing a magical explosion and more. He has a long black and red cape, an eye patch over one of his eyes, a black and red general's cap, and a utility belt. Gorzan - Gorzan is a lizard man and the leader of the "Black Scales", one of the most vicious and powerful bandit gang in the Skylands. He joined the gang at a young age and grow in power after each powerful member died in "mysterious ways". He is considered as a rising star in the criminal community for all of his gang's bold and successful heists. Recently they are rumors that Gorzan has become obsessed with finding lost and extremely powerful artifacts which are called the "Arma Elementa".No one sure what those Arma Elementa were, only that they are somehow connected to the skylanders and that those artifacts had powers that could "shake the very natural and magical balance of Skylands". Gorzan resemble snap shot only without the "horns", his scales are green and his right hand is robotic. Gorzan is using his robotic hand to fight, his hand is actully a very advenced magical machine, It can mimik some of the skylanders elemental powers: in magic mode it can use telekinesis, in tech mode it can shoot variety of projectiles from bullets to small rockets, in earth mode it can create powerful sound wave that can turn the biggest and toughest boulder to dust, in air mode it can shoot powerful wind currents, in fire mode it turns to a flamethrower, in water mode it shoots freezing waters, in life mode it creates a vine like whip, in undead mode it creates a toxic mists, in light mode it shoot a beam of light that can both hurt and temporary blind the target, in dark mode it casts an orb of dark energy that destroy anything it touches. Gorzen is intelligent, sophisticated and cruel, he is not afried to use dirty tricks to get what he wants, he even kills the ones that aided him and his gang's heists just to make sure that there will no lose ends.